Original Editors - Jessica Stevenson from Bellarmine University's Pathophysiology of Complex Patient Problems project. 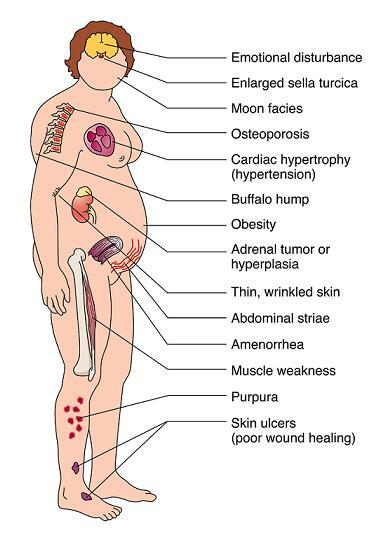 Although there is a classic cushingoid appearance in persons with hypercortisolism and diagnosis is usually suspected based on the characteristic symptoms and signs, diagnostic laboratory studies, including hormonal and imaging tests, are used to confirm the diagnosis. Also, reviewing the history of receiving corticosteroids is important. Differential Diagnosis for Physical Therapists: Screening for Referral. The Merck Manual of Diagnosis and Therapy 18th edition. Pathology: Implications for Physical Therapists 3rd edition. ↑ 2.00 2.01 2.02 2.03 2.04 2.05 2.06 2.07 2.08 2.09 2.10 2.11 2.12 2.13 2.14 Goodman CC, Fuller KS. Pathology: Implications for the Physical Therapist 3rd ed. St. Louis: Saunders Elsevier; 2009: 481-483. ↑ 3.0 3.1 3.2 Harold J Bruyere: 100 Case Studies in Pathophysiology. Lippincott Williams & Wilkins; October 2008: Case Study 52. ↑ 4.00 4.01 4.02 4.03 4.04 4.05 4.06 4.07 4.08 4.09 4.10 4.11 4.12 4.13 4.14 4.15 4.16 4.17 4.18 Beers MH, Porter RS, Jones TV, Kaplan JL, Berkwits M. The Merck Manual of Diagnosis and Therapy 18th ed. Whitehouse Station:Merck Research Laboratories; 2006: 1212-1214. ↑ P Gerry Fegan, Derek D Sandeman, Nils Krone, Deborah Bosman, Peter J Wood, Paul M Stewart and Neil A Hanley. 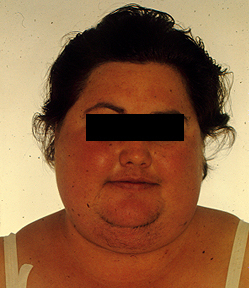 Cushing's syndrome in women with polycystic ovaries and hyperandrogenism. J Endocrinol Invest. 2004 Apr;27(4):375-9.